My husband gave me the novel Less by Andrew Sean Greer for my birthday last summer, and in my usual rush to read older book gifts by the holidays, it was my first book finished in January! This 2018 Pulitzer Prize winner for fiction surprised me because I think of books that win that prize as serious tomes. 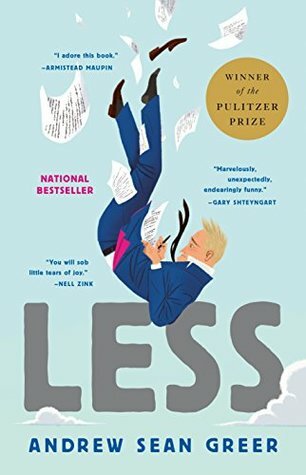 Less is a warm, insightful, and very funny book that explores love and life. Arthur Less is approaching fifty and clearly having some problems with that milestone. When he receives a wedding invitation from Freddy, his recently ex-boyfriend of nine years, he decides to leave town so that he has an excuse not to go. But to just go on a single trip that week would be too obvious, so Arthur, who is a mildly successful but not well-known novelist, puts together a year-long trip around the world by accepting a bunch of decidedly second-rate invitations that he's been ignoring. He starts in New York City, with an unpaid job to interview a famous science fiction author, H.H.H. Mandern, whose next best-selling novel is about to be released. From there, he is attending a conference in Mexico City, where - unbeknownst to him - the wife of his long-time lover, Robert (who was before Freddy), is also invited. Then, he will head to Turin, Italy, where he has been nominated for a literary award he's never heard of for one of his novels that was translated into Italian. He will spend the winter in Germany, teaching a writing course at a college in Berlin; both Arthur and the college think that he is fluent in German, but it turns out he learned German from a teacher who'd never been there herself. His next stop is for pleasure rather than work: spending a luxurious week in Morocco on an expedition through the Sahara to celebrate the 50th birthday of a friend of a friend (and Arthur's 50th is the same week). Arthur will then focus on his next novel at a writing retreat in India. He will cap off this worldwide journey with a stop in Japan, to research and write an article for an in-flight magazine on a particular Japanese cuisine. Finally, he will return home, with the dreaded wedding long past. "Less is grateful the signs are clear because the GPS, after giving crisp, stern directions to the highway, becomes drunk on its own power outside the city limits, then gives out completely and places Arthur Less in the Sea of Japan." Arthur is an endearing character, authentic and sincere, and as he's traveling across the globe and experiencing one crazy thing after another, he's also musing about his past and about love and life. The novel is narrated by an invisible third-party, someone who clearly knows Arthur well and knows all the details of this wild ride but who is removed enough to provide insights into Arthur's thoughts and actions. I enjoyed every moment of Less and look forward to reading more from this award-winning author. Listen to a sample of the audio. Or you can order Less from Book Depository, with free shipping worldwide. I loved this book and thought it was so funny. I loved the literary award that was awarded by teenagers. I howled with laughter, But no one else in my book club liked it. Stuffed shirts! Ha! Can't believe no one else in your book group liked it! What's not to like? It's so much fun! My favorite section was when he was in Germany and considered himself fluent but kept saying such hilarious things!! I laughed out loud through the whole book! Yes, same here! Not what I think of as a typical Pulitzer prize winner!